A Nigerian man and his Vietnamese wife were sentenced to 25 years in prison on Thursday after being found guilty at the Phnom Penh Municipal Court of smuggling 1.5 kg of heroin from Cambodia to Australia in 2014. Samuel Amechi Okeke, 34, and his wife Ho Thi Nhu Thuy, 26, were arrested in July 2014 after customs officials in Australia intercepted 10 backpacks lined with heroin that they had mailed from the Dangkao district post office in May that year, according to police. They were subsequently charged with drug trafficking. On trial last month, Ms. Thuy admitted to mailing the backpacks but said she did so at the request of a friend and was unaware they contained heroin. Mr. Okeke said he knew nothing about the drugs. On Thursday, the court ruled that he did. “The court decides to sentence, firstly, Samuel Amechi Okeke, 34, Nigerian, to 25 years in prison and fine him 50 million riel [about $12,500],” Presiding Judge Than Leng announced in the courtroom, going on to read out an identical sentence for Ms. Thuy. While being escorted from the courtroom, Mr. Okeke expressed disappointment about the ruling. “How can I accept?” he said. Hun Rithy, a deputy bureau chief at the Interior Ministry’s internal security department who led the initial investigation into the case, said he was satisfied with the verdict. “It is appropriate because they are husband and wife, and they colluded,” he said. 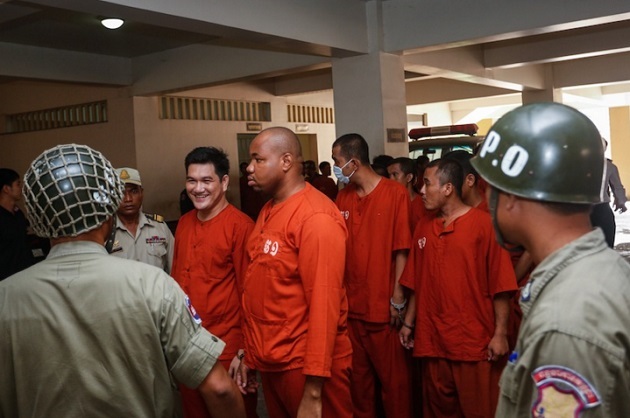 Mr. Okeke, who has been in provisional detention at Phnom Penh’s maximum-security Prey Sar prison since his arrest in 2014, is also facing trafficking charges over 13 kg of methamphetamine seized from a Cambodian man in Phnom Penh late last month—the biggest drug seizure of the year. According to military police, the drugs were part of a distribution ring being operated by Mr. Okeke with four other inmates. All six suspects in the case were charged with trafficking on March 4, CambodiaDaily reports.